Poly over Wax OR Wax over Poly? Hi friends! What do you do when you need the tough durability of a poly, but you want the beautiful antiquing and soft sheen of a wax? Lately, one of the most frequent questions I’m getting is whether to apply poly over wax or wax over poly? You can see how many times I’ve been asked in this one post alone… and it’s a GREAT question! So, today I have a perfect example of this duo topcoat to share with you. She decided on a Sherwin Williams ‘Paris Grey’ custom mixed paint, a dark grey glaze and poly finish. Between Madelyn working on her laptop, and her son on his homework, this desk will get a lot of use. For durability, I used 3 coats of Varathane’s Diamond Polyurathane in Satin. For a vintage antiqued sheen, I also applied Annie Sloan’s Black Wax on selected areas OVER the fully dried coats of poly. Here’s what we started with. And here it is with a poly and wax finish. 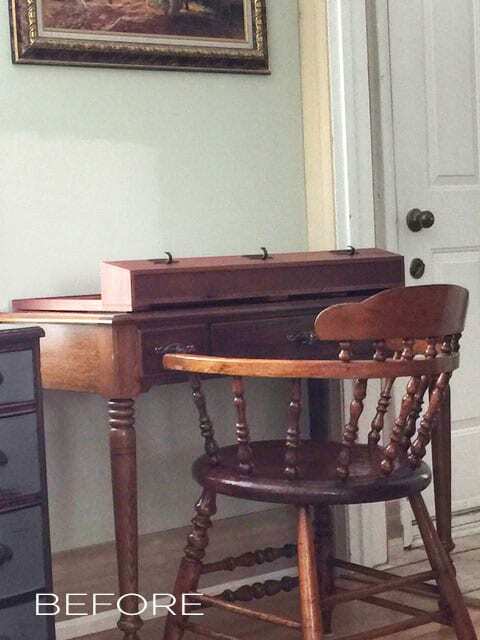 This desk and chair make a really nice one-of-a-kind set. It also has sentimental value because this chair has been in Madelyn’s family for over 50 years. The black wax really helps to bring out all the chair’s character. NEVER the other way around. Just keep in mind that WAX IS ALWAYS LAST. Just like when you wax a car, wax is the very last thing you do for a beautiful finish and protection. 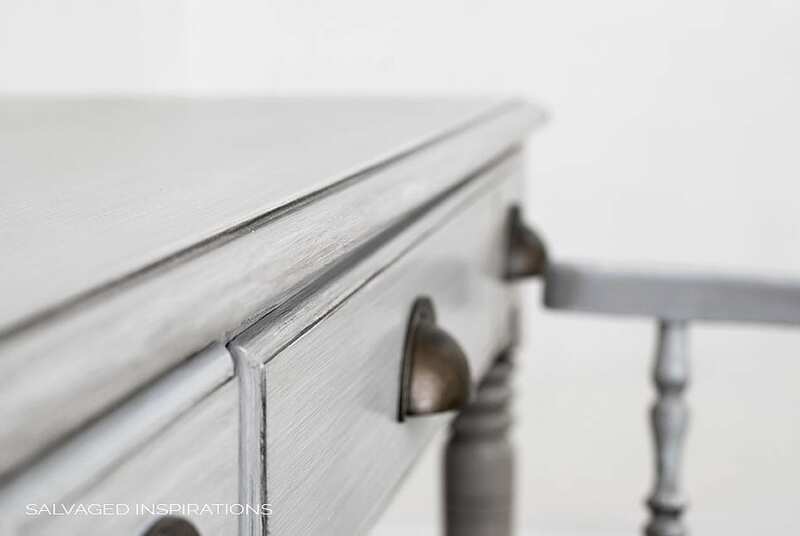 If you’ve waxed your furniture and then decide you’d prefer a poly finish, remove the wax with mineral spirits (in a well ventilated area) before apply a water based poly. Otherwise, the wax tends to repel the poly and it ruins the finish or may be more work down the road. Happy painting and stay inspired! Hello! I have painted my dining room chairs, table skirt and leggings, with Annie Sloan old white. We have sanded the table top down to its natural light/blonde color. We would like to keep it the light color, and maybe add a little bit of white in the grain. 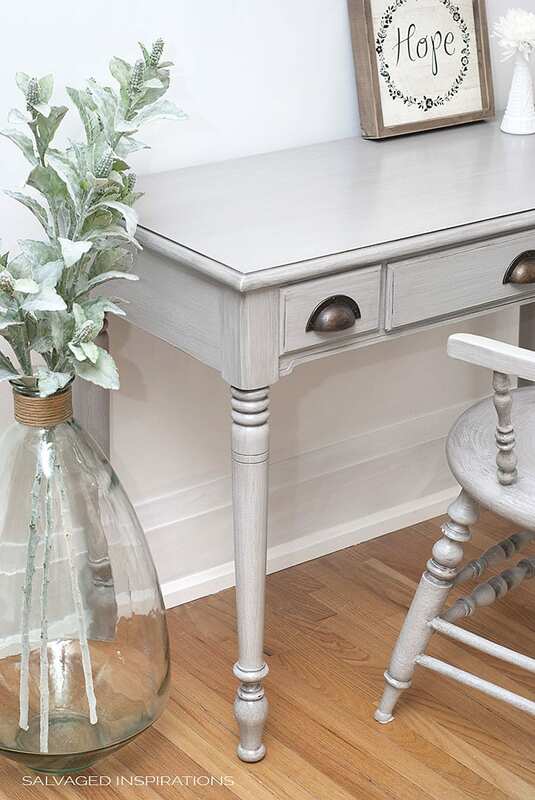 Would we be able to use Annie Sloan white wax on the table top to give it the look that we’re wanting? With the white wax be a durable finish on the dining room table throughout the years and repel water in case of spills? Hi Kellie! In my experience, I prefer a poly on high traffic items like a dining room table. Easy to clean, durable, spill and stain resistant, and no reapplying down the road needed. If you’re looking for for a bit of white in the grain, I’ve used a white wash (with paint) or a pickling stain or a white glaze. All of them look amazing and can be topcoat with a waterbased poly. Hope this helps. I have painted my dining room chairs, table skirt and legs with Annie Sloan Old White. The top of our table is sanded to a raw /blond finish and we would like to keep that look without darkening the wood. 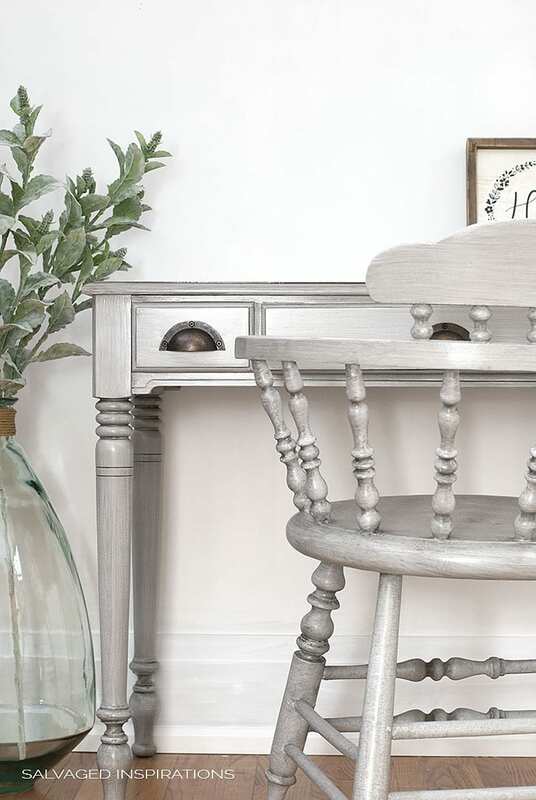 Can we used Annie Sloan white wax to achieve a “light wood with a little bit of white look” without worrying that it won’t last or be durable over the years from use? We like the look of some white in the grain with the natural wood showing through. Any tips? I’m confused, in the title you call it Polycrylic they refer to using polyurethane. I was under the impression these were very different things. That you can not use polyurethane over wax but you can use polycrylic over wax. So are you talking about two different thing, or is a poly a poly no matter if it’s oil based or water based? Hi Jennifer! This entire post is referring to poly – waterbased brands only. Varathane’s Polyurethane is waterbased. Minwax Polycrylic is waterbased. Brands like labeling them different to stand out and be different – but they are all water based poly’s. Great point tho. I can see how that can be confusing. Surprisingly, Polyurethane and Polycrylic are completely different beasts believe it or not. Head over to the article here from Bobvila that explains the differences. So I’ve been searching around and have read that you should never put Polyurethane over wax as it is a fire danger. Also that you can use polycrylic over wax just fine. If I understand right, you have used/ done the former and everything is ok??? 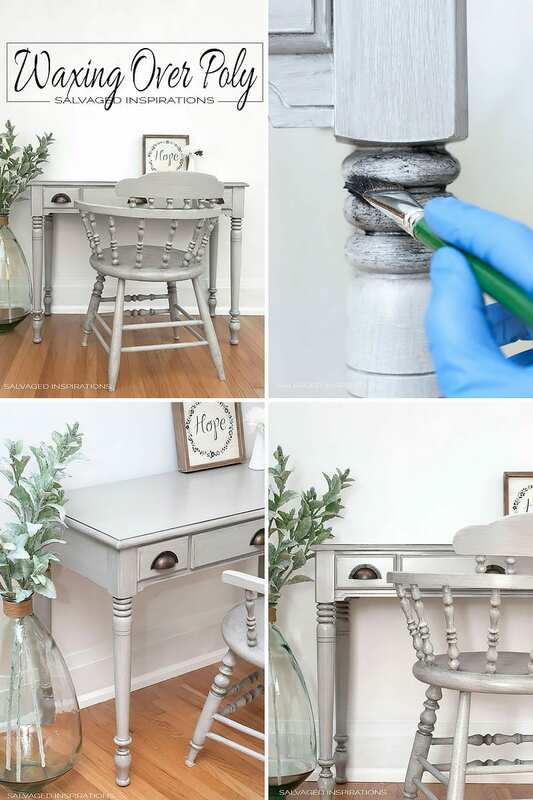 So reading through your blog and techniques, when you use hemp oil over milk paint, can you paint over the hemp oil and also can you use a top coat over hemp oil? I have used wax over hemp oil but never paint or top coat. I chalk painted my old oak dining table all white. Then I used antique wax on the top. I did three coats to get the dark color I want. It sat all simmer in the hot garage until we retired and moved into our house. We recently used paper plates with hot food on the table top. Now there are dull spots where the plates were. Should I rewax then seal with polycrylic to protect it? Hi Carole! Hmmm, have you tried rebuffing the table or adding another light coat of wax, sometimes that’s all it needs. I wouldn’t recommend applying poly over the wax though. If you want to poly the top, I would recommend removing the wax first. I have used an oil based poly over wax since they are both oil base. It does have a glossier sheen but you still have the variations and a really durable finish. I was wondering about this! Thank you! Love this blog!! What a huge help! I just obtained an old oak wine barrel top that I intend to use as a table top. Before I got it, it had been lightly sanded and finished with beeswax and oil. As I plan on using the table on a screened in porch, I want to coat it with either a water based polyurethane or oil-based spar urethane. I would be interested in your thoughts on which I should use and can I cover the beeswax finish without additional preparation. Hi Mark! I would remove the wax (with mineral spirits) before applying any type of topcoat poly. It’s not difficult to do. Just give it a wipe down in a well-ventilated area. Hi! Just received a dark wax dining table (I was not notified it was waxed when I purchased!). The stain is so dark that it rubs off on clothes/ table linens/ anything and everything it comes in contact with. Is this normal for wax? Is there a way I can seal it to stop the color transfer? Help! Thank you for your speedy reply! Could I perhaps put a coat of a clear wax on top of the dried dark wax? The color transfer stains absolutely everything (including skin!). Also, the table top is incredibly soft. Wiping crumbs/ finger nails/ normal traffic leave small superficial scratches. Could this also be because the wax isn’t quite dried yet? Is there like a hard-type wax I could apply over the top? I am searching over and over for the best way to complete a project using dark wax over poly. I have read about it not drying… how long is a good time to allow for it to dry? I used ASCP (red) and wiped some graphite into the details of the wood… now id like to poly and use black wax at the end. NOW.. I am afraid and have put off my customer for a week! I do want to use the black wax heavy on some of the detail on the dresser front and legs… since it is not the TOP of the dresser… do you think it will be OK to apply it heavy? THANK YOU! Hi Natalie! I’ve ‘painted’ with dark wax – examples here and here. It does take longer to dry the heavier you apply it. I don’t sell these pieces right away because they can be messy to the touch at first. I let them dry 24-48hrs, wipe the excess, rinse and repeat until 100% dry. Once it’s totally dry in a few weeks – then sell. What I often do too is seal the top with GatorHide (or another poly) and then wax the body. The top could use the extra protection but the protection from the was is sufficient for the body. This way the wax will dry quicker on straight paint rather than paint topcoated with poly. Hope this helps. I waxed my piece & then applied poly – I read afterwards that this is a no-no. My piece is now shiney ): I loved the waxed look but needed the protection since the top of the piece will be used frequently. Any suggestions on what I should do from here?? 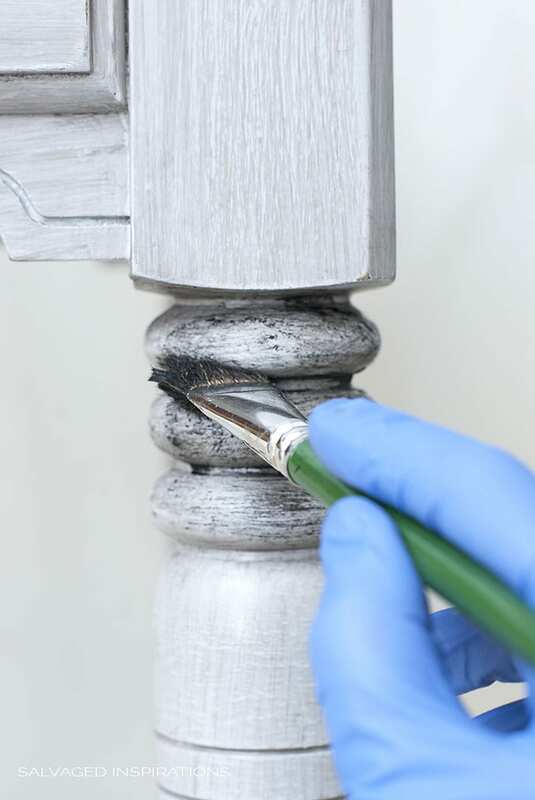 What kind of polyurethane do you use as far as Matt, semi-gloss, gloss, satin? I plan on using a cream color wax over top on the edges. If you use the mineral spirits to remove the wax will the paint come off with it? No. If you put a small amount of the mineral spirits on a cloth (dampen, don’t soak or wet it) and then wipe the surface gently, it will remove a good portion of the wax and not disrupt your paint. Love this! I’m taking on an entertainment center I’ll be chalk painting then Will coat with poly aycrlic (after reading this) then a black wax. but my question is I’ve read you should put clear wax before the black wax. I’ve read for durability purposes but also workability with the black wax. Do I not need that step since I’ll be using the poly? Hi Denise, I took a old dining room table and painted three coats of chalk paint and distressed heavily. I loved the look. I waited 24 hours and I then took a thin coat of polycrylic and painted it on. I didn’t over brush but It dissolved my paint and took away the distressed look making it appear even. Do you know where I went wrong? I’m considering sanding it back down but I’ll need a sealer to prevent ruining it. Thanks! Hmmm, you’ve stumped me. How frustrating! I’m not sure why a poly would disolve your chalk paint but when/if you re-do it, try testing a different brand of poly or use wax. 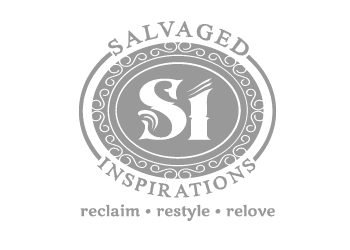 I just happened upon your blog and it is SO helpful! I would love to get the SW code for this “Paris Grey”” paint please. I am refinishing my first table now and that color would be perfect for the chairs! You do beautiful work! Would you please email it to me? Also, perhaps this is a silly questions but how do I know when the mineral spirits has gotten all of the wax off so that I can poly? Thank you! I’m so glad I found your site. I need help! I painted my dining table with Velspar paint for furniture. It turned out well but was still sticky to the feel after a few days drying. So, I added a layer of Minwax, Poly, which turned out well. The only problem is that I chose glossy finish; and now I don’t like it at all! I wish I had chosen satin or semi-gloss. What can I do now to fix it? Hi Karen…I’m so glad you found my site too…welcome! I have a few ideas to cut down the gloss. 1. Give your glossy minwax poly a light sanding – tack clothe clean – and then apply a few coats of flat or semi-gloss poly over top. This will cut down on the gloss. 2. Apply a wax finish over top of the poly and buff, but don’t buff to a high gloss. The wax option will probably need reapplying somewhere down the road though. Hope this helps and good luck. Question: I applied minwax polyurethane wipe on over my painted table (no luck with paint on poly or topcoat-brush strokes would show). However, I don’t like the surface feel. Can I add wax over it once it’s completely dry (for velvety touch)? So I just painted a bathroom vanity with chalk paint and sealed it with clear wax and was next going to use the dark wax. Was thinking to poly over for the wear and tear and water and steam in a bathroom. Should have thought about it before the wax coating and didn’t think of till after and now googling. So absolutely no poly or other after the wax? any other suggestion to keep it looking nice after wax and to protect it? I have waxed two chairs, and decided I would prefer a varnish (like poly) the wax was cured, and as it was also in the viens of the wood, over two coats of chalk paint. Hadn’t seen your post! So I painted another chalk paint, and am wondering what my next step should be, do you think I can varnish (water based) without risk? Or maybe another coat of paint first? Or restart. Can you email me newsletters or tips etc. What causes wax rings on store bought finishes of wood (non-painted)? ( I am a little scared to use wax because i have seen rings on peoples furniture. )Just wondering. i have noticed so many different types of paint being used. How do you decide what type of paint to use ? Hello, I am new to painting furniture but I used dark wax because I love the vintage look now I want to add Poly will that ruis the piece? I have bought a second hand solid wood table. Beautifully finished and no problems until we ate dinner and every plate left a white ring. I am wondering if I could put a coat of wax on top to protect from heat and moisture. I do not know what the finish is on the table. Any thoughts? Hi T! 🙂 I have never applied poly over wax so unfortunately, I can’t answer. I’m thrilled it worked for Natalie (she didn’t mention the brand names she used) but I don’t recommend it. I wrote this post because there is a lot of confusion and wax repels water. Period. It’s best to poly first, wax second. Hope this helps. I’m not so sure that the brands matter. I have used a couple of brands of wax and never had any issue in applying poly over wax. I love the soft gleem of wax as well – but I have always applied poly over wax. My thinking is that the poly acts to lock in the waxed look. I don’t ever remember using wax over poly – but this desk looks amazing so I may have to switch it up! I am always in a hurry to seal in the chalk paints I use – allow the wax to dry then apply the poly as the stronger more durable surface protection over the top. I usually always read if uncertain – but I have been using chalk paints for several years and have never experienced a problem with poly over wax. It’s nice to know it can be done both ways. I of course read this after I put poly over wax 🙁 what actually happens? Does it not dry? Everything looks ok so far but it’s tacky 18 hours later but that might be because it’s humid out…. Hi Wanda! It may dry in time but it’s like waxing a car – and then using a water-based product on top of it… it’s not recommended. The wax will repel whatever waterbased product you used. Ideally, the wax is always last. What protection make & brand did you use over wax, as I can’t find anything anywhere. Though they tell you NOT to do this method though I need to protect wax furniture without stripping it first etc…. Be grateful if you could clear this up for me as I’m pulling my hair out with my searches!! Me too. Did you find out what brands she used over her wax? Polyacrylic over wax never polyurethane. Might be why it works? Been yeah, I used polyurethane over was, took 2 to 3 days with a fan o. It yo dry. Once it was I put 3 more coats on. Thank goodness it finally all dried, my first time with was but my tables turned out awesome!!! Hi Natalie! I”ve already waxed but would like to poly as well. What brand poly did you use? Thanks! Can you use the wax over minwax polyurethane alkyd? Hi Cindy! Yes, you can. I always use wax after poly because it gives it a more professional look. I use clear unless I want to do a more antique look. I am going to try white wax I’ve n see if it is a different look. Actually over the weekend, I painted a bar and the bar stools and after the paint was dry and a couple coats of polycrylic on top. Once that was dried I finished with dark wax. Absolutely love the finished pieces. Now just finished painting our dining chairs and the final poly coat is drying. Tomorrow will be adding my wax…as I prefer the antique look of it over the glazing style. Thanks for the article and you did a great job on the chair! Hey there! I stained a wood top with wood finish that was not as dark as I wanted. I glanced over and saw that annie sloan dark wax so I decided to put that on before I had put the polyurethane that I already bought on…. What should I do to put a clear durable finish on? I am in a pickle from reading all of your post. I want to paint oak kitchen cabinets. I have been told it is very difficult to get a smooth finish due to the grainy texture of the wood. What do you recommend? Hi Melinda! Very true. Getting a totally smooth finish on textured wood takes a few extra steps and can be labor intensive – even if you know what you’re doing. I’ve smoothed out wood grain on furniture before only to see I’ve missed some areas along the way! All the textured grain needs to be skimmed and filled in before priming and painting. I would suggest ‘googling’ the steps involved before deciding which method to use. I’ve heard of people using wood fill, Bondo and glass resin type products on cabinets. Hope this helps. Thank you!! Sure enjoy your site!! I painted old oak cabinets that I moved from my old house to my new one. I just painted them with a mustard gold color enamel paint followed by a french blue. Than I sanded them to let the brown oak show through for a distressed look. Afterwards I stencil painted with the gold paint but I sort of just dabbed it to look distressed with a fleur de lis pattern on the upper doors to look like an old hutch. The cabinets were put on a seperate wall by themselves and nothing else was painted like this in the room. I put on a pine shelving countertop and stained and polyed it. It looks like an old piece and I got many compliments. I also put bead board on the sides before painting. Long story, this was 2 coats of enamel paint over original old oak cabinets that were new in the 80’s and I really had no trouble with a rough grain problem ! Hope this helps! Never heard of using both poly and wax together on top of painted surfaces. Didn’t know that was possible. 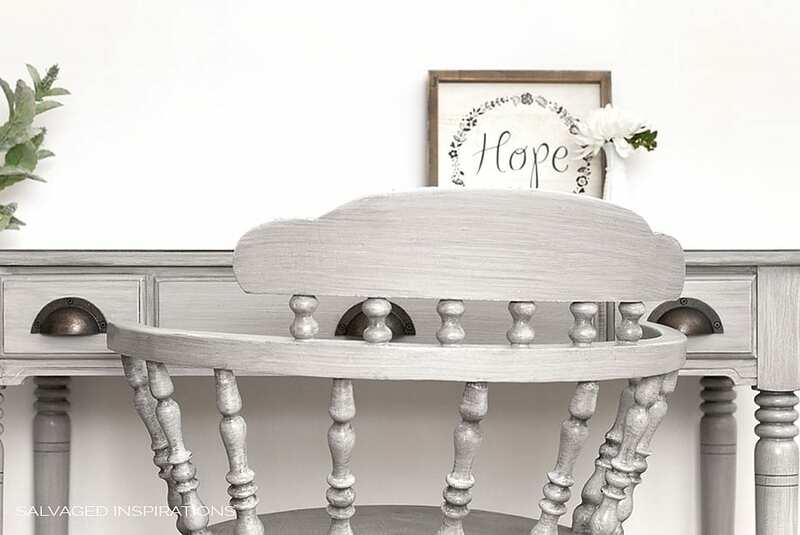 Thought Annie Sloan Wax was made to be used over Annie Sloan Chalk Paint. I have used General Finishes High Performance Satin and Flat over General Finishes Milk Paint. I’m always concerned about poly yellowing painted surfaces. I’ve had that happen before. Hi Alice! Yes, you can use both! 🙂 And you bring up a really good point about yellowing painted surfaces. Polyureathane (oil based) does amber over time, and Polycrylic (water based) can take on a slight yellowing over WHITE or very LIGHT paint. If/when it happens, it’s usually minimal, so not an issue over mid to dark paints or surfaces with any type of glazing or antiquing. I’m having trouble finding the Varathane Diamond Poly locally. 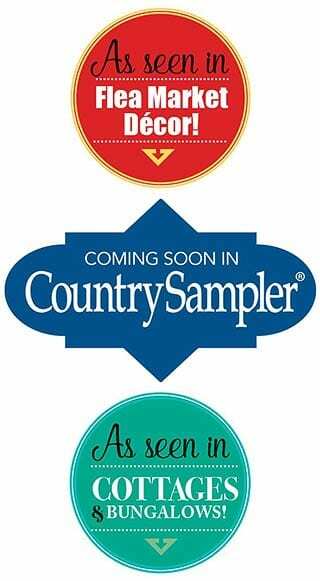 Is there another brand you would recommend? I’m paining a desk and dresser in a creamy white. Hopefully the yellowing will not turn the paint too yellow. Any thoughts? Yeah, it’s getting harder to find for sure. Maybe they aren’t making the Non-Yellowing anymore??? Anyway, a few thoughts. With a creamy white you should be okay with a reputable brand. Minwax, Varathane, General Finishes and I recently tried Dixie Belle’s Gator Finish and LOVED it and they say it’s non-yellowing although I’ve only tried it on stain so far. Also, I find when I apply the poly with a lighter hand (light coats) rather than heavier, it really helps on lighter paint colors. I often add a coat of wax over my poly or clear coat finishes. 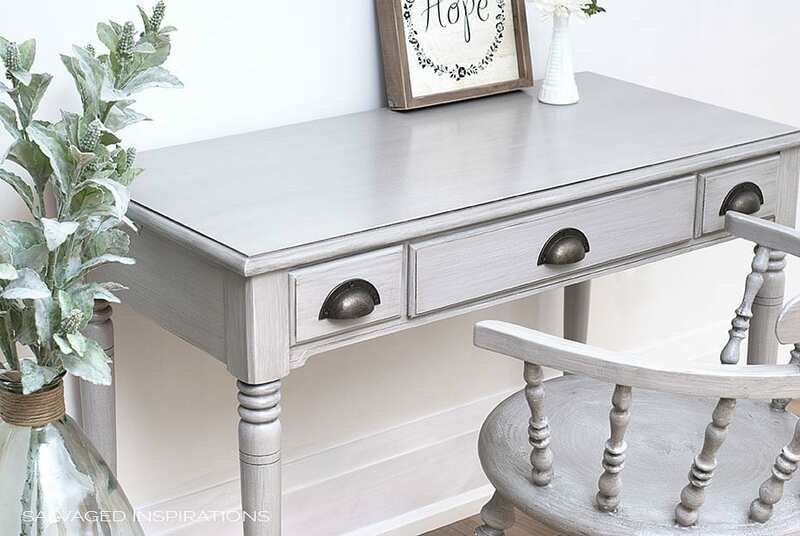 I just like more of the matte look the wax gives and use the clear coat when I want a more durable finish on higher use areas such as a dresser top. I have used antique wax, black wax and just clear wax depending on the look I want. It works great. What a beautiful custom set Denise! Your client must be so happy. I love the color. And BTW. ..if I haven’t told you before, your blog is incredibly inspiring AND informative. Thanks for sharing . Did you thin the dark wax with something like mineral spirits before you applied over the poly? Hi Denise! I need help please! I painted a desk with annie sloan pure white and noticed it started to bleed. So i applied Zinsser’s shellac and painted again. This time, no bleeding. Yay! I then thought i was almost done and sealed it with a varnish (Modern Masters dead finish) which was recommend instead of wax because of it’s durability. Now the bleeding came back! Any ideas? 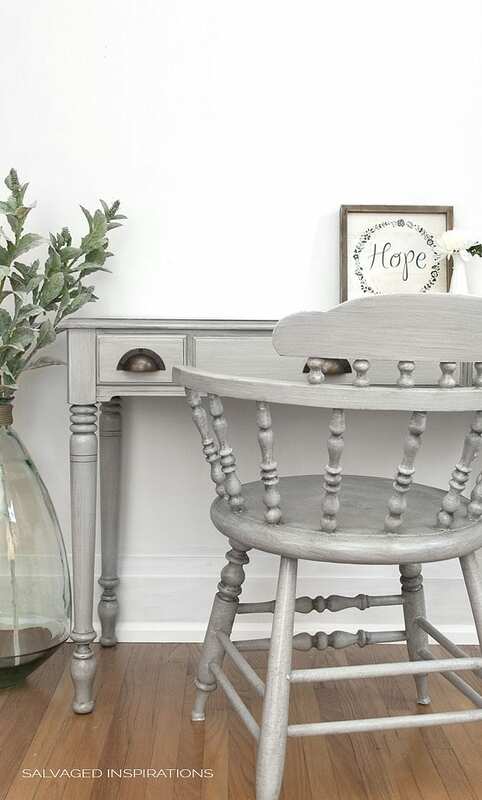 Should I start all over and try a paint other than chalk paint? Thanks for your help! Hi Mary! I know how frustrating this is! Topcoats will often pull through stains and tannins. This has happened to me so many times – that’s why I switched and use BIN Shellac Primer. Zinsser Shellac works, but you can never tell exactly how many coats will work because it’s clear. When you use BIN, you can see how many coats are needed because the bleed through can be clearly seen through the white primer. Once it’s not staining any more – you know you’re safe…even with topcoat. Having said that, if it were my piece,(and I’m assuming you want to stick with the clear shellac product you have) I would sand off the topcoat, reapply a few more coats of shellac, paint and topcoat again. Hope this helps. I just refinished all my kitchen cabinets using the Annie Sloan paint in Graphite. I applied 3 coats of poly to seal. Over that I applied the Annie Sloan dark wax. It turned out beautiful. I just hope it lasts in a kitchen. It sounds beautiful and durable Kathy! I bet the dark wax over the graphite and poly adds a lot of depth! what brand of poly did you use? I am having trouble finding Varathane Diamond locally. Absolutely gorgeous! I would love to do this exact thing with my mother’s 70 year old dresser that was handed down to me. How can I get the same paint from Sherwin Wms? How would I as them to mix it? May I have a copy of that paint color swatch too? I am painting an entire bedroom set and this is a neutral color that will work well for the entire room! Hi. Would love that formula as well. I have an entire cream bedroom set to do and love that colour Also the steps from the beginning to end. Would you suggest I paint a gripper primer first to a bin primer. I have used fusion paint before and used a gripper first? Hi Anne! I’ve emailed you the formula. 🙂 As for priming first, for sure. Gripper is a great primer if you’re painting over a sealed surface with no bleed through. BIN Shellac if wonderful if you need to control bleed through. PERFECT TIMING ON THIS POST DENISE! I have always either used wax OR poly, but never both. I have wondered whether that’s what I should be doing to give a painted piece an extra durable finish but never wanted to spoil the job I had just done. Reading your post has given me the courage to try this method. Thanks for this great tip. If you need only minimal protection, can you leave the piece glazed only with no poly & no wax? Would glaze only be enough protection or would it be easier to chip the paint? Really like the color combo on this desk & chair. I am new to furniture refinishing and have a question. I just painted an old dresser using Valspar furniture paint in satin finish. I then used their dark antiquing glaze over that. I am thrilled with the result – exactly as it is. Should I use a polycrylic in satin over the glaze to protect or can I leave as is? The dresser will be in a spare bedroom, no kids, minimal use. I invested so much time into the project I want to make sure I protect it properly, but don’t want to change the look from how it is now (furniture paint with dark glaze over). Can you advise? 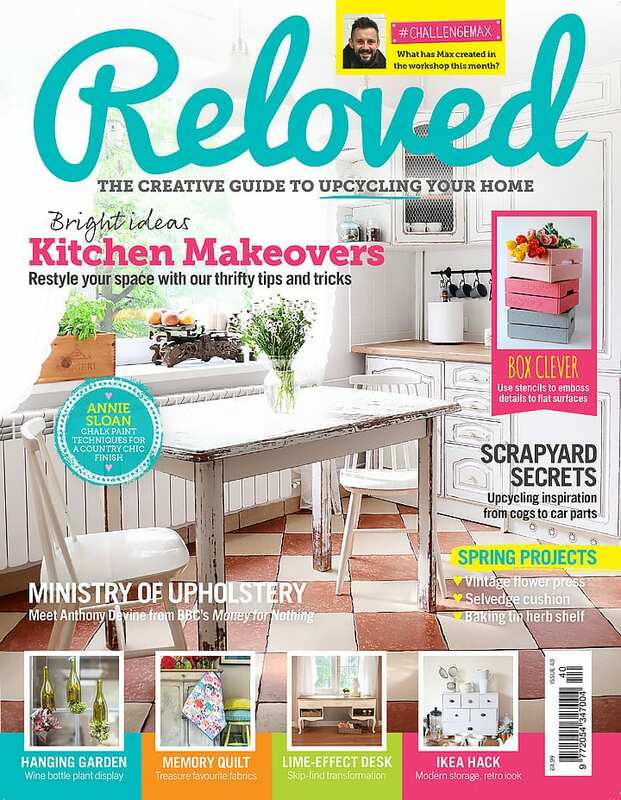 Love your blog btw – inspiring me to redo all the furniture in my house! It is beautiful Denise!!! Thank you for sharing!!! What have you used as a dark grey glaze? Thanks Vassi! 🙂 I used Behr Glaze Medium (which I can’t find anymore at Home Depot so I don’t think they sell it anymore. I’m on the hunt for a replacement!) with this Hurricane Gray paint. Mixed 4 parts glaze to one part paint. I love poly and wax together! I like to spray poly followed by wax. The best of both worlds. Thank you for always sharing your experiences. I learn so much!